I love discovering new polish brands and trying them out. 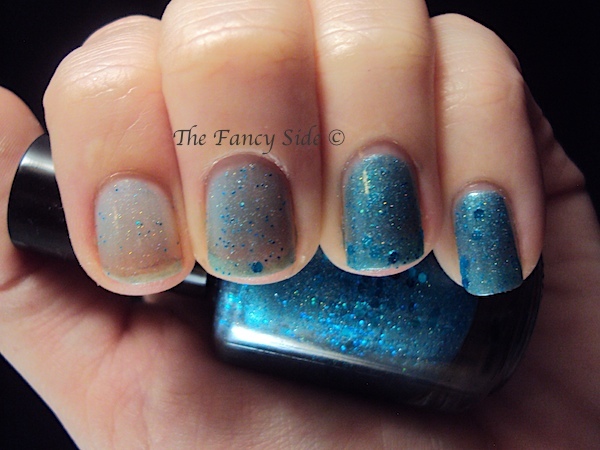 Make it an indie brand, filled with glitter & shimmer, and you've got my favorite kind of polishes. I recently had the pleasure of getting acquainted with Nikki and her brand Flossy Lacquers. Nikki sent me four polishes to check out and I'm in love. When the box came in the mail I wanted to die from the pretty overload. Just a quick note. On each of my swatches you'll see the polish layered over a base on my thumb, then 1 coat on the pointer, 2 coats on the middle, 3 coats on the ring, and 4 coats on the pinky finger! Lets get to it! Up first we have Chik Chiky Boom! 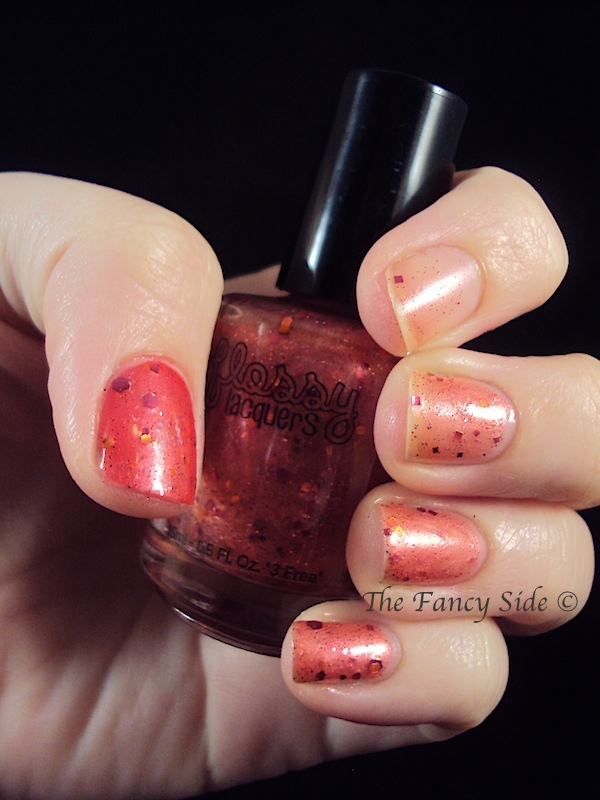 Chik Chiky Boom has a shimmer pink jelly base with magenta shimmer, red-magenta hexes, orange hexes, and tiny pink glitters. 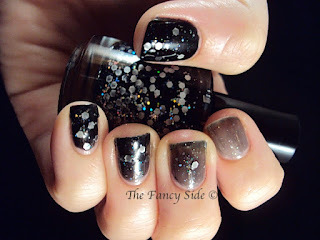 If you look really closely there is a smattering of fine black glitter as well, which just amps this polish up even more. I've never seen a polish combination like this one. It's very unique and very pretty. 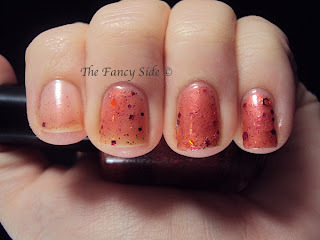 On my thumb I've layered Chik Chiky Boom over 1 coat of China Glaze Italian Red. I love the layered look, but it is also opaque after four thin coats and totally wearable on its own. This is Barbarella meets Godzilla. Barbarella meets Godzilla is a jade jelly base filled with jade shimmer, pink hexes, and a shade brighter green hexes. 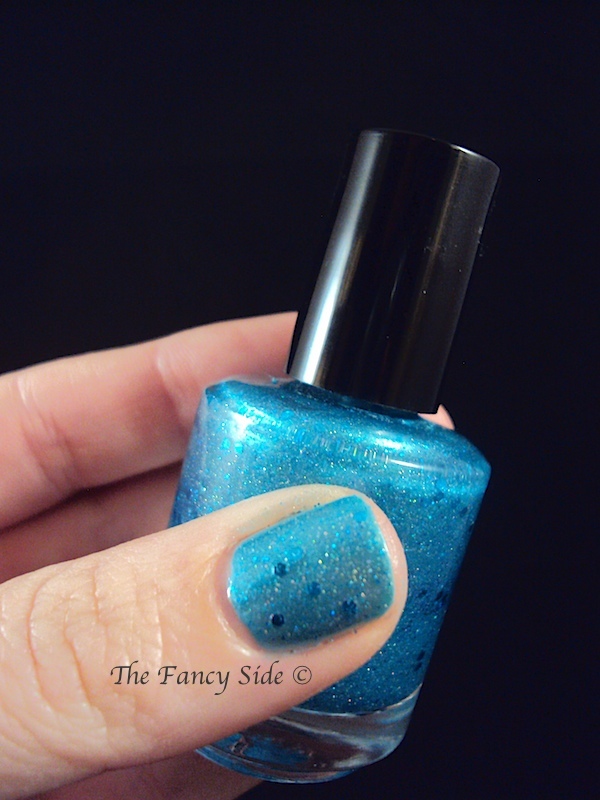 The combo of glitters with the base is stunning in this polish. 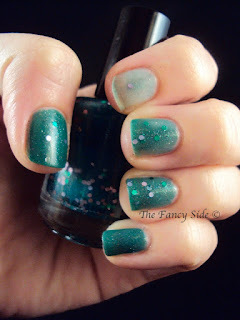 On my thumb you can see the polish layered over Maybelline Color Show's Tenacious Teal. 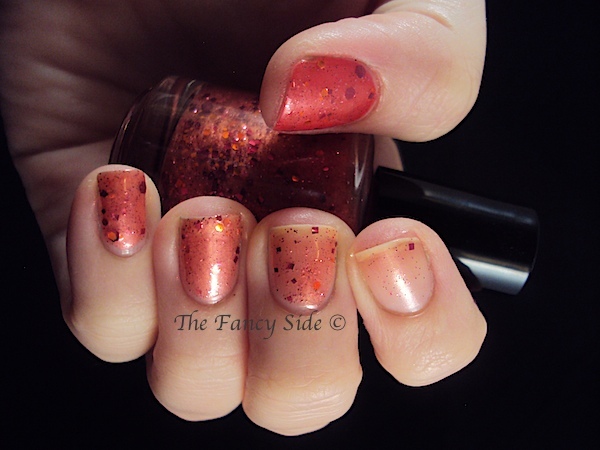 This polish was the hardest one to work with as the glitters here were harder to pick up on the brush. I think next time around, I'll add some thinner. I'm hoping that will solve my problem. Shipwrecked Sailor stole my heart as soon as I unpacked it. My GOD! 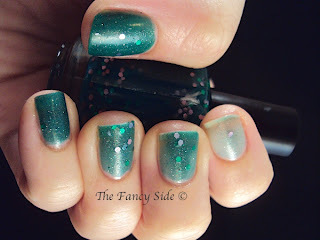 How can you not love this polish, I mean LOOK AT IT!!! This polish has more of "crelly" base inbetween a creme and a jelly. 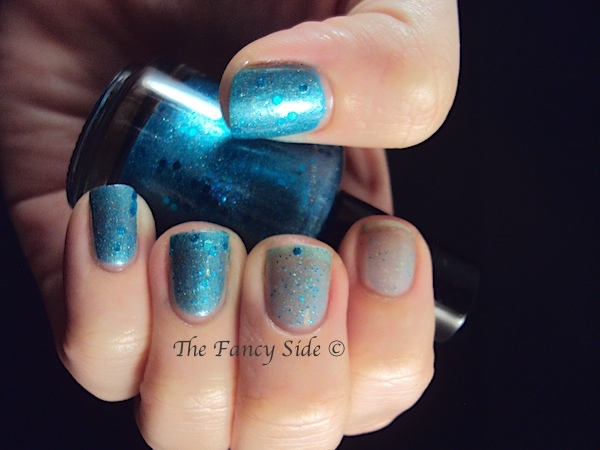 Light blue base with matching shimmer and matching hexes. On my thumb I have it layered over OPI Can't Find my Czhecbook. This polish is so going to end up in regular summer rotation for me. Up last is Bedtime Paradox. I won't lie. I was least attracted to this polish upon first receiving them. That makes it even better that this is my FAVORITE from the collection. It was a surprise winner and that makes it the best kind of winner. Bedtime Paradox is a black jelly base filled with small holographic glitters and accented with white hexes. I love how this polish comes together. The flashes of rainbow, the jelly sandwich effect with the white hexes. Looking at these pictures makes me want to wear it again. I've layered it over Maybelline Color Show's Onyx Rush on my thumb, but as you can see 4 coats makes it just as opaque and better in my opinion. You can visit Nikki and Flossy Lacques at her Etsy Store. Each polish retails for $7.50 which in the land of indies is so very cheap. Overall I love this collection and I'm so thankful that Nikki gave me the chance to check them out. I can't wait to wear these again and again. I'd highly recommend them to anyone, especially Bedtime Paradox. You need that in your life!! I know right. It is amazing. I think that last one is my favorite too. 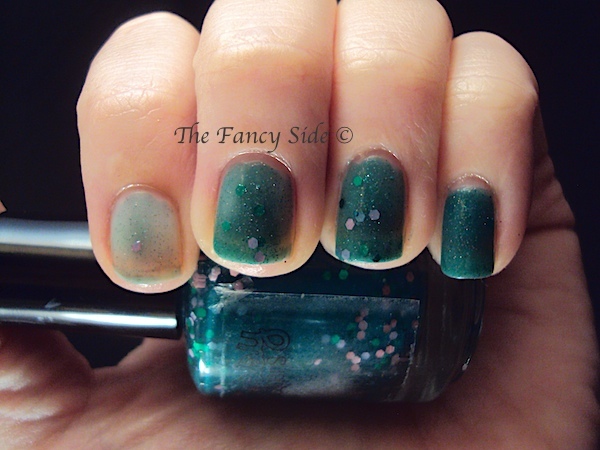 It reminds me of Orly Androgynie only except for the fact that this polish seems to actually work. I like the holo and large white hexes. Very cool! It's simply amazing. You can't go wrong with Bedroom Paradox.